Cryptanalyzing the security weaknesses of authentication protocols is extremely important to propose countermeasures and develop a truly secure protocol. Over last few years, many three factor-based authentication schemes with key agreement have been proposed for multi-server environment. In 2017, Ali and Pal developed a three-factor authentication scheme in multi-server environment using elliptic curve cryptography (ECC) to remedy the security flaws in Li et al.’s scheme and claimed their improved version can withstand the passive and active attacks. In this paper, we prove that Ali-Pal’s scheme is subject to offline password guessing attack, replay attack, and known session-specific temporary information (KSSTI) attack. In the same year, Feng et al. 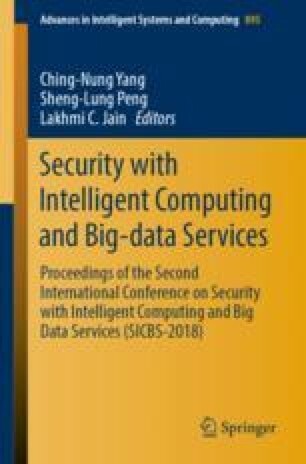 examined Kumari et al.’s biometrics-based authentication scheme for multi-server environment and found that their scheme was vulnerable to several attacks. To fix these weaknesses, Feng et al. proposed an enhanced three-factor authentication scheme with key distribution for mobile multi-server environment and claimed that their scheme can satisfy the security and functional requirements. However, we show that Feng et al.’s scheme fails to resist offline password guessing attack, and suffers from replay attack. In addition to point out the security defects, we put forward countermeasures to eliminate the security risks and secure the three factor-based authentication schemes for multi-server environment. This work was partially supported by the National Natural Science Foundation of China (Project No. 61672007), Science and Technology Innovation Guidance Project 2017 (Project No. 201704030605).